In June 1935 a pre-production batch of sixteen Hs.123 A-0s (Werke Nos. 628 to 635; and 788 to 795 inclusive) were ordered based on the V-4, the first of which was ready to fly in July 1936 and the last of the batch took to the air that same December. These A-0s were followed by the A-1 (built by both Henschel and A0), which featured armour protection and a windshield for the pilot, and B-1 of all-metal construction, of which Henschel (three-digit Werke Nos.) built 100 in five batches, for a total of 240 aircraft, which, with the prototypes and A-0 variants, resulted in 265 aircraft (one prototype being rebuilt and allocated another Werke No. as recorded above). The V-5 and V-6 prototypes and one A-1 (Werke No. 788) utilized the BMW 132J V 55 engine for dive-bombing tests. Another A-1 (Werke No. 789) experimentally used the BMW 132J 55 engine (Werke No. 55042). The Sturzflugerprobung at Rechlin also used two other aircraft (Werkes Nos. 819 and 2247) at Rechlin up until 16 January 1937. They were fitted with the Revi 3b bomb sight and later adopted the Revi C/12 A gun sight. Another A-1 (Werke No. 958) was retained by Henschel for experiments with the all-metal ailerons, which were later fitted to the B-1 series. By 11 January 1938, 223 Hs.123s had been received and by 25 June a total of 255 had been delivered of a total of 262 including the prototypes. She first entered service in the summer of 1936 and, against all odds and predictions, was fated to continue serving until late 1944. The initial production A-1s joined the 1./162 Immelmann. The Hs.123 was combat-tested, as were so many of the fledgling Luftwaffe’s new aircraft, in the Spanish Civil War. The superiority of the Junkers Ju.87 ensured that the Hs.123 was not to last long as the Luftwaffe’s principal dive-bomber and after only a short period, production was stopped. 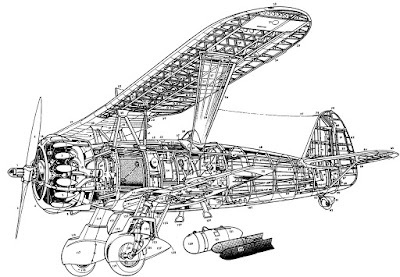 The Henschel Hs.123A-1 was a single-engined, single-seat, open cockpit, biplane dive-bomber and close-support aircraft. She was of sesqui-plane plan form and was principally of dural sheet construction, with fabric-skinned wings and tail components, while the B-1 was an all-metal machine. She was fitted with a fixed landing gear. As was usual at this period some aircraft were fitted with the FuG VII radio equipment with a stub aerial mast atop the upper wing and aft attachment atop the tail, while most were, initially anyway, not so equipped. A total of 261 Hs-123s were produced, including six prototypes (one given two Werke Nos.) and the sixteen pre-production models. The Henschel company built 139 of them at their Johannisthal and Schönefeld, Berlin, plants, seven prototypes, 103 production models for the RLM and twelve for China and a further 140 were subcontracted to AGO-Flugzeug Werke at Oschersleben, Börde, north-west of Leipzig who completed 129 of them. The last Hs.123 rolled off the line in October 1938. The Hs.123A-1 had an overall length of 27ft 4in (8.33m), a height of 10ft 6.33 in (3.21m) and an upper wing area of 3,940 sq ft (0.36604 sq. m) The total wing area was 267.482ft2 (24.85m2). She was powered by the 880hp (656.03kW) BMW 132Dc 9-cylinder radial engine with a NACA cowling, which drove a two-bladed, variable-pitch, metal propeller. She had a maximum speed of 212mph (341km/h) at 3,936ft (1,200m), a cruising speed of 196mph (315km/h) at 6,560 ft (2,000m), with a climb rate of 1,640ft/min (500m per/min) and a ceiling of 29,350ft (900m). Her internal fuel capacity was 59.4 Imperial gallons (270 litres) and she could carry an external aluminium fuel tank of 34.34 Imperial gallons (130 litres) capacity, which could be jettisoned in an emergency. Other than the Heinkel He.51, the Hs.123 was the first to carry such a tank. Her normal range was 534 miles (859km). The weights were 3,131lb (1,420kg) empty, with a maximum take-off weight of 4,795lb (2,175kg). The armament consisted of two 0.312in (7.92mm) MG-17, fixed, forward-firing machine-guns in the upper noses with 500rpg magazines. She had an external gun sight mounted just before the small windshield. Her offensive armament was steadily developed as time went on. Initially she had five hard-points with a ventral fuselage main ordnance capability of a single 551lb (250kg) bomb carried under the central fuselage on a swing crutch, which threw the bomb forward and outward between the undercarriage, and two inboard, under-wing fitments rated to 441lb (200kg) each, and two outboard under-wing hard points of 110lb (50kg) each. Alternative bomb loads were one 551lb bomb and four 110lb (50kg) bombs; four 110lb (50kg) SC-50 bombs, or, later, two containers each holding 92 × 4.4lb (2kg) fragmentation bombs, or an alternative fitment of two under-wing pods each housing a 20mm MG FF cannon. The I.St.G. 162 received D-ILRO, D-IPFY, D-IYLU, D-IZHO, D-IGMH, D-IHFY, D-IKLY and D-IKSW and on 1 April was re-designated as the IV.(St)/L.G. at Schwerin, Mecklenburg-Vorpommern, moving to nearby Barth in July; D-IKHA, an A-0 (Werke No. 788) went to the E-Stelle at Rechlin; while D-IJOM, an A-1, went to Hansa Lufbild for aerial photography operations. Among other units the Hs.123 equipped the 3./ Fliegergruppen 10 and 50 in 1938; A/B Schule 71 (A-1); the 7./St.G. 165 Immelmann (A-1); the II./SG.1 (A-1); the SchG.1; (A-1 and B-1); and the 4./SchG.2 (B-1). Other civilian registrations included D-ILVA, D-ILVY (Werke No. 2331); D-ILXL (Werke No. 2259), D-1OJI (Werke No. 2317), D-IPNC, an A-1 (later carrying WL-IPNC) and D-IYQU (Werke No. 2319). The II./St.G. 162 was formed at Lübeck-Blankensee on 1 April 1936, and later that year converted to the Hs.123 through to March 1937, when it helped in the formation of the III./St.G. 165. On 1 April 1937 II./St.G.162 was re-designated as the I./St.G.167. The unit carried out intensive training duties for a year before re-equipping with the Ju.87. The St.G. 165 was formed at Kitzingen of 1 April 1937, with the Hs. 123 and moved to Schweinfurt, Bavaria, where it re-equipped with the Ju.87. The I./St.G. 165 began reequipping with the Hs.123 in March 1937, converting to the Ju.87 in September. The II./St.G. 165 formed on 1 April 1937 with the Hs.123 instead of the planned Heinkel He.70s, but began conversion to the Ju.87 in August 1938. The III./St.G.165 likewise formed with the thirty-four Hs.123s at Fürstenfeldbruck, shifting based to Wertheim on 1 October, where it began re-equipping with the Ju.87. At the time of the Munich Crisis Fliegergruppe 10 was created at Tutow, Demmin, on 1 August 1938 with the Hs.123 As drawn from all manner of units. A crash familiarization course followed in case of war and in September the unit moved to Brieg, Silesia (now Brzeg). Once the Sudetenland was occupied and digested into the Reich, these machines all dispersed back to their units once more, many of them re-forming as the I./St.G. 160 at Insterburg, East Prussia, in November where they converted to the Ju.87. Similarly Fliegergruppe 50 was hastily assembled for Munich on 1 August 1938, at Lechfeld, Bavaria, and equipped with the Hs.123, moving to Grottkau, Silesia, on 20 September. These aircraft gave air cover for the troops moving into the Sudetenland working from Paulsgrund, Ratibor (now Racibórz). At the end of the crisis the Hs.123s were used to form the II./St.G.163 on 1 November at Bad Langenslza, Thuringia, and then at Breslau-Schöngarten where they converted to the Ju.87. Another Munich emergency unit, Fliegergruppe 20 was at Tutow where, on 1 November, it was re-designated as II.(Sch. )/LG.2 and began re-equipping with the Hs.123. In a similar fashion Fliegergruppe 30 was demobilized to Straubing in Lower Bavaria, and re-equipped with the Hs.123 and supported the occupation of the ceded Czech territories. On 1 November 1938 it was based at Barth and was re-designated as the new I./St.G.162. The II. (Schlacht)/L.G.2 (coded L2 +) was destined to become the most famous of all Hs.123 units. On formation at Tutow, on 1 November 1938, with aircraft from the disbursed Fliegergruppen 20 and 40, and containing a battle-hardened cadre of Spanish intervention veterans, this unit was one of the most professional in the Luftwaffe. Conversion to the Hs.123 followed, and, in turn, they were scheduled to move on to the Ju.87. 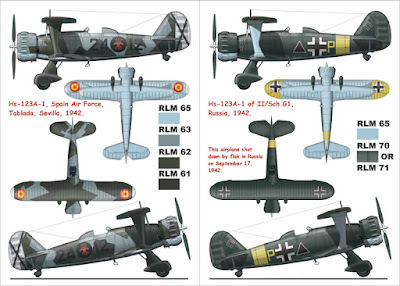 For, despite outstanding work achieved in Spain, realistic exercises held in 1938 convinced the Führungsstab (Command Staff) that biplanes had no future role in war for the Luftwaffe and the Hs.123 was largely withdrawn and replaced by the Junkers Ju.87 Stuka. The two constructors, AGO and Henschel, received orders that all jigs, models and production tooling for this type were to be scrapped forthwith. Moreover the Schlachtfliegerguppen (Close Support Groups) were also abandoned in the aftermath of the Czechslovakian crisis. The sole remaining unit, Schlacht 10,13 was absorbed into the Lehrgeschwader 2 becoming II (Schlacht)/LG 2, and by 1 September 1939, remained the only surviving operational HS.123A-1 unit, the bulk of the remainder passing to the training cadres. So successful was she to subsequently prove in the ground-attack profile that in 1943 calls were made to renew production afresh, but by then all the jigs had already been destroyed long ago and, by 1944, there were insufficient spare parts to keep her operational but a few remained operational, working with training units, until the German surrender in May 1945.